This book has a trigger warning for suicide. If this topic makes you uncomfortable, step lightly into reading this review or book. 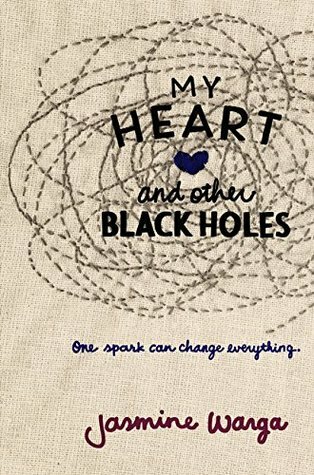 “My Heart and Other Black Holes” by Jasmine Warga is a book about sixteen-year-old Aysel (pronounced Uh-zell) who is extremely depressed after the murder her father committed three years prior. She has lost all of her friends and she feels outcast by her family. She goes on this website called Smooth Passages and finds an ad for a “suicide partner” and says she’ll do it with this guy on the specific day that he requested, about six weeks later from that point. But as she keeps on thinking about how much her death from the world will help her, she realizes that maybe there is more to the world. I started reading this with a lot of sensitivity brewing in me because of my personal past (and present) and how much I can relate to Aysel’s feelings of depression and suicide. That being said, that is not why I rated this 5/5 stars. The writing was fantastic and kept the plot moving forward. Yes, at times I thought it was a bit slow and dragged out, but I also understood the importance of those scenes when they made a reappearance later in the book. The plot itself was something I’ve never read about – or have chosen to read about. As it’s such a personal topic for me, I have a very sensitive heart when it comes to it. But the story itself was gripping and I wanted to cheer for the characters to get better and to realize it wasn’t their fault and that it does get better. But I understand how depression works and how that black slug that Aysel kept on referring to just squirms around in your heart and your whole being to now allow you to see the light behind the darkness that’s enveloping you. The plot consisted of a concept I wish also didn’t exist: suicide partners. They were planning the day in which they would do it, they found a spot where they wanted to it, and they made some conditions in which they would used to keep themselves on track. But I think that Aysel and Roman slowly developed that friendship and kinship and chemistry over their short time together because of their common bond in depression. Roman felt he was to blame for his sister’s death; Aysel was afraid of how others would think of her if she turned out exactly like her murderous father. As they developed the kinship and really got serious about everything, and slow buds started to open Aysel’s heart and shine in that light, I loved it when it became a turning point. I thought there was great character development. I saw the transformation in Aysel and was so glad when I saw it. Roman was the tough one and the stubborn one, but I completely understood where he came from and why he blamed himself so heavily for what happened. Yes, there were some parts that could have been explained more or actually happened (I really wanted her to confront her father) and maybe some things should have been different, but for the subject matter of the book, this was beautifully written. As I stated, I rated this book 5/5 stars. And please. If you or someone you know is in a situation like this, please have them (or you) talk to someone who can help and be a positive bright light in that darkness. You have no clue how much that light will be of value to that person one day. Suicide is and never will be a joking matter. Don’t make light of it. Not all stories end like Aysel’s and Roman’s, so please, just reach out for help if it’s needed. This entry was posted in Book Review and tagged 5 stars, book, contemporary, diversity, jasmine warga, my heart and other black holes, read, reading, review, suicide, we need diverse books, wndb, ya, young adult. Bookmark the permalink. I’ve never read the book, but your review was utterly beautiful. Thank you. This is a stunning review. I need to read this now! Thank you. Definitely a good read for sure. Lately, I am into books that deal with self harm or depression. I might pick this one up next. Your review was great as usual. I wish I could write reviews as you do! Thanks! I always think my reviews aren’t really “reviewy” but yay for them connecting with people! And the subject matter itself is interesting – but not the fact that it can and does happen in reality, you know?